In the classic film, Eating Raoul, Paul Bartel’s character derisively announces that he and his wife, played by Mary Woronov, do not swing. The pair do however off swingers to steal their cash. Today’s Nice Price or Crack Pipe Dodge is said to have once appeared in the TV show Swingers, but is its price worth killing for? Kenosha Wisconsin’s best Anticuchos; the best little whorehouse in Texas; the most durable engine in the world. While two of these three examples of pinnacle of performance are open to debate, the last - in reference to Chrysler’s venerable Slant Six - is pretty much a given. Not only is the the 30-degree from vertical pushrod six legendary for its durability, but also for its flexibility in producing both power and economy. The four-barrel HyperPak introduced in 1960 pumped the 225-CID six up to 196-bhp, while a later two-barrel version made the Plymouth Feather Duster an honest 30-mpg car. 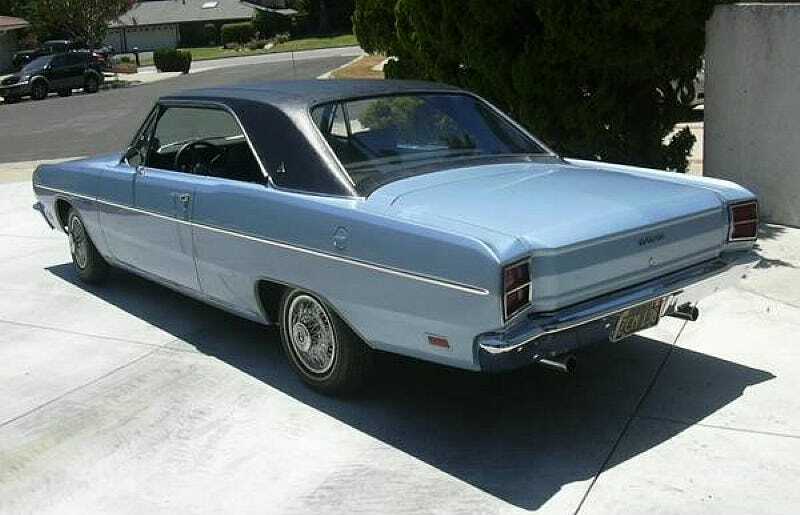 Today’s 1969 Dodge Dart is claimed to be a hot rod, and is motivated by the lay down sally six. Why slant? Well, there were a lot of reasons. The 30-degree from vertical design allowed for lower hoodlines, and also provided room for straighter intake and exhaust paths giving the engine better breathing. The design also allowed for the water pump to be tucked in on the side under the exhaust manifold, providing a shorter engine. This ’69 takes advantage of all the room created by the engine laying down on the job with the fitting of a trio of 40DCOEs and split tubular headers. The appearance is both weird and wonderful, and represents a refreshing change from the typical V8 found in most cars of this ilk. The engine is said to have been built .030 over and with a bunch of Clifford Performance parts. Its aesthetic is equalled by the cleanliness of the presentation. Mated with the hot six is a TorqueFlite 727 which is also claimed freshly rebuilt with tough kid parts. Wrapped around all the wonderful mechanical goodness is a two-door pillar-less coupe body that would make your granny proud. Featuring medium blue paint topped by a black vinyl roof framing the Dart’s iconic concave rear window, the overall look is appreciably subtle. The ’69 Dart came with lots of chrome, and all the brightwork on this example seems to be in excellent shape. Those of you living in California will likely also appreciate that the car maintains its era-correct black and gold plates. The interior shot in the ad doesn’t give much of an indication as to how nice a place it may be, but it does at least show a dash-mounted dial tach, column shifter, and a wide bench seat, all plusses in my book. In fact, what seems to be the only questionable aspect of this car is the phony wire wheel covers on what look to be period-correct but undersized for today tires. Considering that those elements are just a few lug nuts away from changing, and that the car even comes with the wrench to do so, I think that would be a minor consideration. Requiring far more rumination is the price, which is a not insubstantial $12,000. Very obviously you would be hard-pressed to replicate this car for that amount, and there is the fact that it seems to have at one point been a TV star. Then again, so was Amanda Bynes. 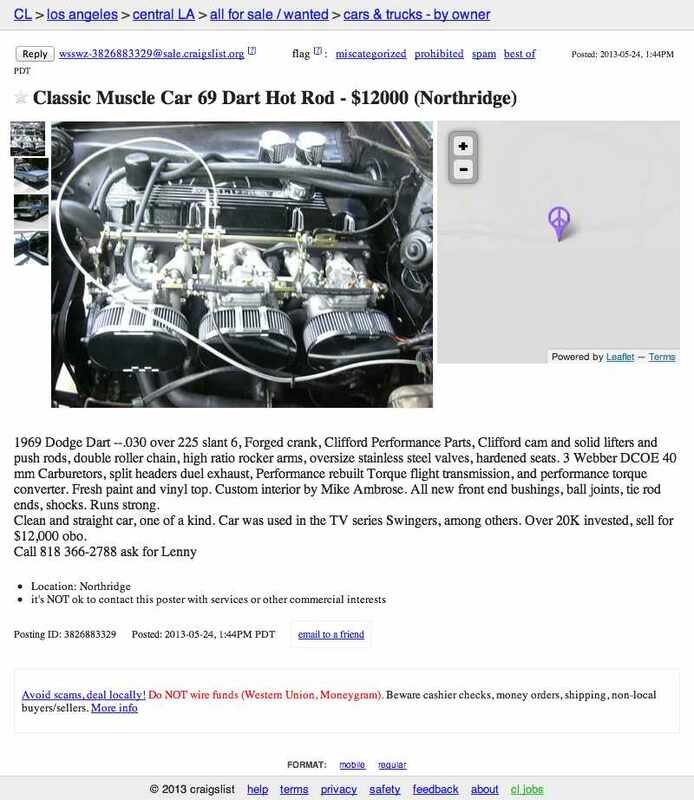 What do you think about $12,000 for this slant-six powered Dart? Is that a price with which you could swing? Or, does that make this Dart a slant that can’t?